Rockcliff to Commence Drilling at Laguna Gold Property — Rockcliff Metals Corp.
Rockcliff Metals Corporation (“Rockcliff” or the “Company”) (TSX.V: RCLF) (FRANKFURT: RO0, WKN: A2H60G) is pleased to announce that a first phase drill program will commence on the Company's high-grade Laguna Gold Property located in Snow Lake, Manitoba. The Laguna Gold Property hosts the past producing Rex-Laguna Mine that was Manitoba's first and highest-grade gold mine. The 2,500 metre drill program marks the first drill program on the property in over 70 years. Rockcliff's President & CEO, Ken Lapierre, stated: "We look forward to testing the gold potential at the Laguna Gold Property and are excited to be partnered with Kinross on the property. The high-grade gold potential is evident on the property where over 100,000 tonnes grading 18.7 g/t gold was mined mostly during the 1930s. ; The drill program will focus south of the former high-grade gold mine where additional quartz veins were discovered this fall carrying visible gold and sulphides. Additionally, these veins are coincident with Induced Polarization (IP) geophysical anomalies that are identified to depths of up to 250 metres." Rockcliff's initial reconnaissance exploration program in 2016-17 identified 7 historical surface high-grade gold-rich quartz zones with multiple areas of visible gold and surface grab sample assays from trace to over 600 g/t gold. Follow-up geophysical programs including airborne magnetics and surface IP surveys covering the 6.0 kilometre long Laguna Gold Mine Trend identified significant potential extensions of the known surface gold-rich quartz zones along strike below a thin veneer of cover. IP anomalies associated at surface with the quartz zones extend to depths of 250 metres, the maximum penetration of the IP survey. The Fall exploration program uncovered numerous additional quartz-rich gold-bearing zones, some with visible gold that will be tested in the first phase drill program. 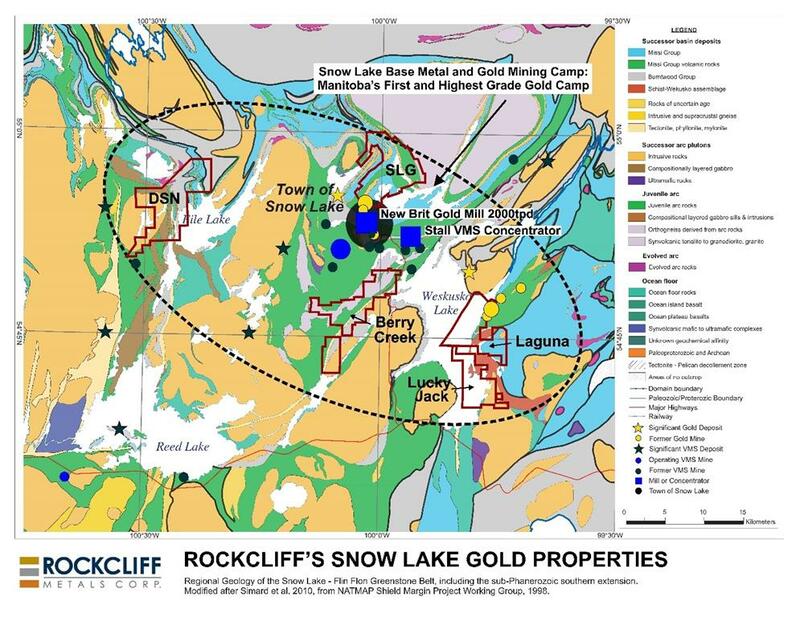 Figure 1 - Rockcliff's 5 district sized gold properties in the Snow Lake area, including the Laguna Gold Property. Click image to view larger or link here.